Thank you for your interest in WCHSA’s 2018 spring conference! With an anticipated 150 attendees, purchasing an exhibit or sponsorship provides your company with a unique opportunity to make connections across Wisconsin and talk with county human services leaders and our partners about your products and services. We have several options available for exhibition and sponsorship so you can select the one that’s just right for your organization. Credit card payment is accepted, or you can select the invoice option and pay by check. Registration deadline is FRIDAY, MAY 4, 2018. Exhibition is from Tuesday noon through Thursday noon with a Vendor Reception on Wednesday evening. An exhibit includes one exhibit table with two chairs; electricity and internet; meals and breaks for one representative; and conference attendance. Additional representatives from your company are welcome to attend for $125, which includes all meals and breaks. Really get noticed by sponsoring and exhibiting! Associate member organizations receive a $50 discount on listed package prices. 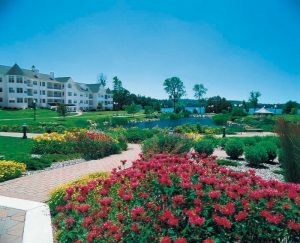 A block of rooms has been reserved at The Osthoff Resort for May 14, 15, and 16. To reserve your room, please call The Osthoff Resort directly at (855) 876-3399 and ask for the Wisconsin County Human Service Association (WCHSA) room block to secure the conference room rate. Rooms must be reserved by WEDNESDAY, APRIL 18, 2018. Please contact Katie Herrem at katie@wchsa.org or (608) 630-2160 with any registration or conference questions.